The vampire squid (Vampyroteuthis infernalis, lit. 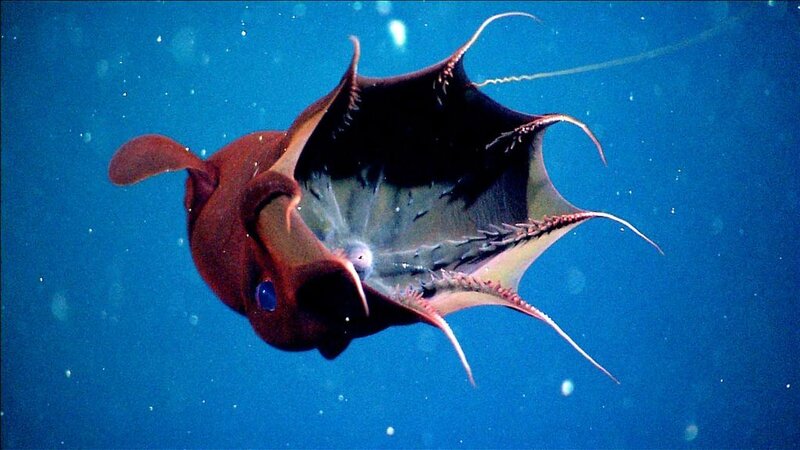 "vampire squid from Hell") is a small cephalopod found throughout temperate and tropical oceans in extreme deep sea conditions. Unique retractile sensory filaments justify the vampire squid's placement in its own order, Vampyromorphida, as it shares similarities with both octopuses and squid. As a phylogenetic relict, it is the only known surviving member of its order. The first specimens were collected on the Valdivia Expedition and they were originally described as an octopus in 1903 by German teuthologist Carl Chun, but later assigned to a new order together with several extinct taxa. The vampire squid can reach a maximum total length around 30 cm (1 ft). Its 15-cm (6-in) gelatinous body varies in colour from velvety jet-black to pale reddish, depending on location and lighting conditions. A webbing of skin connects its eight arms, each lined with rows of fleshy spines or cirri; the inner side of this "cloak" is black. Only the distal halves (farthest from the body) of the arms have suckers. Its limpid, globular eyes, which appear red or blue, depending on lighting, are proportionately the largest in the animal kingdom at 2.5 cm (1 in) in diameter. The name of the animal was inspired by its dark colour, cloak-like webbing, and red eyes, rather than habit—it feeds on detritus, not blood. Mature adults have a pair of small fins projecting from the lateral sides of the mantle. These fins serve as the adult's primary means of propulsion: vampire squid "fly" through the water by flapping their fins. Their beak-like jaws are white. Within the webbing are two pouches wherein the tactile velar filaments are concealed. The filaments are analogous to a true squid's tentacles, extending well past the arms; but differ in origin, and represent the pair that was lost by the ancestral octopus. The vampire squid is almost entirely covered in light-producing organs called photophores, capable of producing disorienting flashes of light ranging in duration from fractions of a second to several minutes. The intensity and size of the photophores can also be modulated. Appearing as small, white discs, the photophores are larger and more complex at the tips of the arms and at the base of the two fins, but are absent from the undersides of the caped arms. Two larger, white areas on top of the head were initially believed to also be photophores, but are now identified as photoreceptors. The chromatophores (pigment organs) common to most cephalopods are poorly developed in the vampire squid. Although the animal is, therefore, incapable of changing its skin colour in the dramatic fashion of shallow-dwelling cephalopods, such ability would not be useful at the lightless depths where it lives.